Now with streaming Real Audio. Email me and I'll see if I can help. The quality of these clips is not brilliant.Good quality equals large files which need a lot of band width. The quality is only that of Radio Luxembourg listened to under the bed covers!! Where I've given two clips I've tried not to make repeats in the clips, the short clip is not included in the longer one.That's it - I hope you enjoy the clips and feel they were worth it. A quick warning about thae volume - 'Territory' and 'Little Ladies' are much louder - I will sort it out eventually but in the meantime - turn your volume down or RRRRock !! Blueberry Hill - given the Little Ladies treatment. Little Ladies - their 'theme song' but strangely never released on album or single. All three Little Ladies have a chance to sing solo on this one. 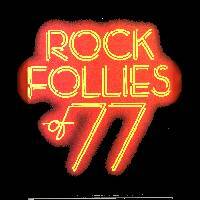 FOLLIES of '77 - "Welcome to the Follies, of '77, do you get the feeling we have only changed the name?" 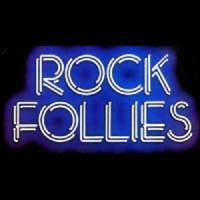 THE BAND WHO WOULDN'T DIE - "And we never gave up dreaming 'cause we're the band who wouldn't die"
From Episode 5 of Rock Follies of '77 - The Divorce. As Anna's paranoia grows she and The Angel face Dee, Q and Rox in a final shoot-out over 'territory' in one of Rock Follies many fantasy scenes. ROLL YOUR OWN - Sung by Dee (Julie Covington) and Rox (Sue Jones Davies). An impromptu jam during a gig with Rox and Rawls. No short clip this time - just the full thing. In My Cans - Our three ladies struggle with their 'cans' whilst recording their first record. click on the CD picture. That's all for now - hope you enjoyed them.